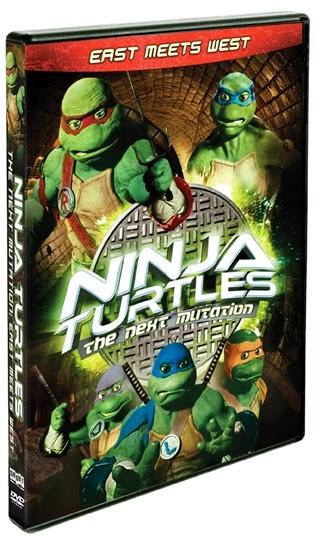 On March 4, 2014, Shout Factory released Ninja Turtles: The Next Mutation – East Meets West on DVD. Being that I not only loved these guys as a child but that now my two boys love them just as much, we had to have this one. We've only seen the cartoon versions together and I knew this would be a much more realistic version they could enjoy. They are always playing the old school arcade version game on our Xbox 360 and have become quite obsessive about it. The synopsis says "Leonardo, Raphael, Donatello and Michelangelo are four genetically mutated turtles who have grown into human-sized, ninja-powered crime-fighters living in the sewers of New York City. Under the tutelage of Master Splinter, these four teens have spent their formative years fighting their nemesis, Shredder, and his evil army. But the turtles’ world is about to change….and if you thought Shredder was bad, wait until you meet the newest TMNT foe: Dragon Lord! It will take all the power of the turtles to combat this new villain…but luckily for them, they will have help from a new ninja turtle, a female turtle named Venus De Milo!" Recommendation: Both boys loved this as if you couldn't tell from the review portion! I think this is totally worth all $7 bucks and then some. I can't believe this one is listed so cheap! You are getting something your kids will love to watch over and over if they enjoy this type of action! Giveaway: Shout Factory is going to give one of A Lucky Ladybug's lucky readers a Ninja Turtles: The Next Mutation: East Meets West DVD of their own! My favorite program as a child was Herbie" the car-my mom and dad took my brother and I to a drive-in movie. It was so cool! Sure wish I could take my two daughters to a drive in! My favorite show as a child was The Howdy Doody Show. My favorite program as a child was a TV show called "make a Wish". we love the original ghost busters. My favorite program as a child was Punky Brewster. My favorite show as a child was Bewitched, The Jetsons and The Flintstones. My favorite show growing up was Casper the Friendly Ghost. I love the clover background and I especially like that the contests are on the side and it highlights the ones that you have already clicked. I think my favorite shows when I was a child were Sesame Street and a Baltimore show called Captain Chesapeake. My favorite show as a child was The Smurfs. My Favorite show was The Magic School Bus. Punky Brewster!!!! miss that show!! I loved Punky Brewster! I thought she was just the coolest of cool! My favorite program as a child was the Looney Tunes. I would like to see more of Sid The Science Kid DVD's listed for a giveaway. My favorite program as a child was The Brady Bunch, I still watch it in reruns from time to time. My favorite show was Bill Nye the Science Guy! I loved the idea of learning about the world around me! My fav would have to be Power Rangers. My top two favorites were Ghostbusters and Teenage Mutant Ninja Turtles, which my fiance thinks is awesome! I loved Daria! Thanks so much for the chances to win. My favorite was The Flintstones. My favorite show growing up was the Transformers. ThunderCats was my favorite show. My favorite shows as a child were Rainbow Brite and She-ra. my favorite was full house when i was little. I liked the old Nickelodeon cartoons! Rugrats was my favorite!! I also liked Doug and Ren and Stimpy. I liked the smurfs as a kid. I remember watching the Muppet Babies. My favorite show as a child was The 13 Ghosts of Scooby Doo. She-ra was my favorite program when I was a kid. I loved watching it with my friends. I really enjoyed watching the old nick shows like the rugrats. I loved Little House on the Prairie & still do! I loved the care bears.